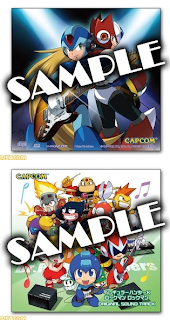 Capcom has recently opened the doors to a small web page promoting the upcoming Irregular Hunter X/Rockman Rockman PSP value pack. It's a pretty bare bones web page, not much to look at other than a few shots of the packaging and the bonus soundtrack (pictured). The value pack, and it's subsequent soundtrack (featuring 30 tracks worth of IHX/RR music) will ship on September 17th, 2009 with a 2,900 Yen price tag ($30). Did anyone ever figure out if Play-Asia gets you the CD too? Or will we not know until after it comes out? Too bad I don't have a PSP or I'd pick this up. Cool! X has the same guitar as I do! What the hell!? X is playing a guitar? That's actually hilarious! That X album art is the best I have EVER SEEN. My only gripe is that its not a full OST...30 tracks isn't much, but I guess for a freebie you can't complain. Proto's guitar is really thin o.o that thing made outta paper or somethin'? o_o rawk on I gues.. 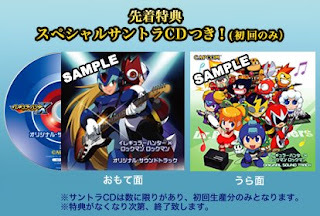 I wish that damn sample text wasn't covering the artwork because X and Zero with electric guitars is just about the best thing ever. Everyone: "...And ONE FOR ALL!!" Why does the site say Playstation 2?